To be truly happy, they say you should do what you love for work, though to be fair, not everyone can support themselves live blogging the Gilmore Girls. From a woman who's turned what she loves into some sweet men's duds, Eubiq NY. This outer-wear heavy, cool-weather drop's the latest from an NY-based, street-inspired line that turns out utilitarian takes on classic menswear, all hand-patterned by its FIT-trained designer who launched the label when she started spending more time "in front of her sewing machine" than at work, though to be fair, it was blocking her apartment's exit. 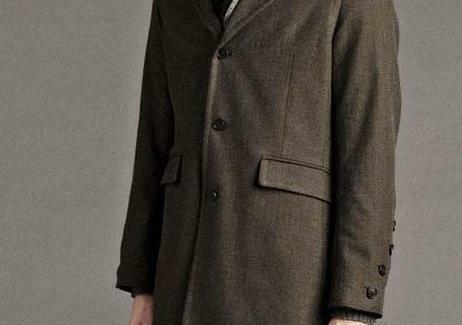 Jacket-ness starts with the field-style button/zip dual-closure Terrain w/ four front flap-pockets; a suit-collar'd car-coat called the Nazaire w/ epaulets and asymmetrically buttoned cuffs; and the deconstructed pea-coat-style Everett, usually a staple on what not to where. Other gear ranges from hoodies (the black on black full-zip Dieter w/ inset front panel), to sweaters (the Admiral w/ an offset henley-style collar), to knits (the front-pouch-pocket'd Funnel Neck pullover), to a red/blue plaid button-up called the Drake, which prefers to go by last name: ever, first name: greatest; middle name: shirt. Because outwear requires something inner, Eubiq's also got graphic tees like the inverted-triangle arted Abra, on which a magic words letters disappear, and the swirling black/gray arted Smoke, also what got you so into those clever ladies from Stars Hollow in the first place.